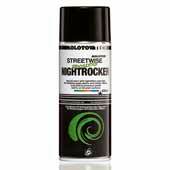 Molotow Nightrocker - Glow in the Dark Spray paint Molotow is the world's leading spray paint innovator. The Night Rocker or Glow in the Dark spray paint is a sign that they are ahead of the pack. This is real Glow in the Dark spray Paint. The paint goes on clear and is charged by light. When the light is removed the paint will glow brightly in the dark. If you have a special project, it's good to know that Molotow has solutions for you. Molotow is the world's leading spray paint innovator. The Night Rocker or Glow in the Dark spray paint is a sign that they are ahead of the pack. This is real Glow in the Dark spray Paint. The paint goes on clear and is charged by light. When the light is removed the paint will glow brightly in the dark. If you have a special project, it's good to know that Molotow has solutions for you. Thes paint is quite expencive. But i'ts great for tactical graffiti, which i love. you will stand out, and get known Damn quick. If you have the cash... pick it up. 17 of 18 found this review helpful - did you? 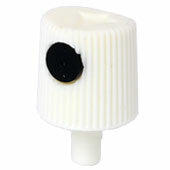 This product was added to our catalog on Friday October 24, 2008.